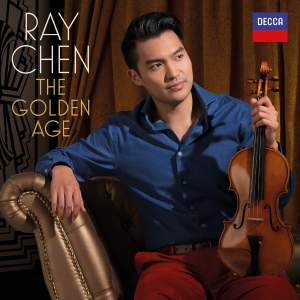 Decca Records has today announced the release of Australian violinist, VC Artist Ray Chen‘s new album: Ray Chen: The Golden Age. Recorded to celebrate the ‘golden age’ of the violin, the new disc, Ray’s first on the Decca Classics label, includes the Bruch Violin Concerto with conductor Robert Trevino and the London Philharmonic, transcriptions of favourite parlour works by Kreisler and Heifetz – plus three new Made in Berlin string quartet arrangements. “I’ve always been fascinated by the sound of the great violinists of the past … Oistrakh, Heifetz, Kreisler, and so many more of that era …” Ray has told The Violin Channel. “We have a lot of great tracks from the Bruch Violin Concerto to Kreisler and Heifetz violin/piano arrangements … as well as completely new arrangements done by the cellist in our quartet, Made in Berlin,” the 29 year old former Menuhin & Queen Elisabeth International Violin Competition 1st prize winner has said.